Easton Corbin’s sophomore album, “All Over the Road,” was released back in September, 2012. By this time, all of his fans know the songs “Lovin’ You is Fun” and the album’s title track, “All Over the Road.” These two songs were released as singles, and both did well both on radio, and on the country charts. 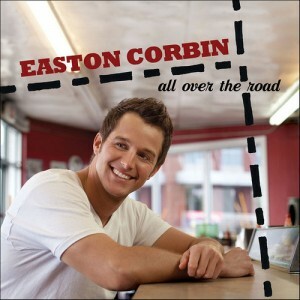 But there are nine additional songs on this new CD that Easton’s fans are going to want to know about. As you will see from the list of song titles and the writers for each song, Easton does more than sing on this new album. He had a hand in writing two of the songs. The first and second tracks are his the two he’s already released, All Over the Road (Carson Chamberlain, Ashley Gorley, Wade Kriby); and Lovin’ You is Fun (Jim Beavers, Bob DiPiero). The nine that follow are That’s Gonna Leave a Memory (Tony Martin, Mark Nesler, Roger Springer); Hearts Drawn in the Sand (Michael White, Jason Saenz); Dance Real Slow (Carson Chamberlain, Ashley Gorley, Wade Kriby); A Thing for You (Easton Corbin, Carson Chamberlain, Tony Lane); Are You With Me (Tommy Lee James, Terry McBride, Shane McAnally); This Feels A Lot Like Love (Easton Corbin, Carson Chamberlain, Mark D. Sanders); Only A Girl (Carson Chamberlain, Wade Kirby, Will Nance); Tulsa, Texas Tony Lane, Mike Lane, David Lee); and I Think of You (Thom Shepherd, Jeff Silvey). Since Easton first released “A Little More Country Than That,” back in 2009, people have been comparing his voice to George Strait. In fact, when hearing his debut single for the first time, a lot of folks thought it was actually an old George Strait song, and that George was singing it. While that is an easy comparison to make, you will hear a lot this new CD that is unmistakably Easton. “Only A Girl,” however, is the one on the new album that instantly reminds the listener of George. “A Thing for You,” is one Easton had a hand in writing. It is one of my favorites on this album, with the kind of lyrics that make you want to listen, and not miss even one word. ‘Farmers farm and painters paint, God is good, and the devil ain’t… Summers hot and sidewalks crack, don’t ask me why it goes like that…” You’ve made your point, Easton, it just doesn’t get any more country than that. “Are You With Me,” the albums sixth track, does slow things way down for listeners. I know country music fans pay a lot of attention to lyrics. I go to concerts, I hear them singing along. This is one I am sure they will play close attention to, and they will remember the words. Things speed back up with “This Feels A Lot Like Love.” When that song starts, you are probably going to want to get out of your seat, start clapping your hands, and you will most likely want to sing along. It is the kind of song that works for Easton, and I believe it would make a good single. The Florida native has a lot to say in this album. He has a good mix of strong ballads and more than likeable mid-tempo music. Whoever put the songs in order for the CD ended with “I Think of You.” This slow song with its romantic lyrics definitely made it the right song for the final spot on the album. Even though is first single made it to No. 1 on the country music charts, he seems to have a more confident sound now than when his career first began. He has definitely found his place in country music, and it looks like he will be part of the industry for many years to come. If you haven’t had an opportunity to see Easton in concert, you can keep up with his show schedule on his web site www.eastoncorbin.com. His web site will also point you in the direction of his facebook and Twitter account. Whenever you have time to catch up on country music news, visit us at www.countryschatter.com.